For a time in the late 1980s, a local TV station in New York City aired late-night reruns of Naked City. The show, a black-and-white police drama set in New York, had originally aired from 1958 to 1963, the year of my birth. Those years were a critical period in the civil rights movement, and, in its quiet way, Naked City reflected that. The show’s regular cast—playing a squad of detectives—was as white as the cast of every other show of the era, and so were most if not all of its guest stars, but in small parts, not all of them speaking roles, blacks had begun to pop up here and there. It wasn’t much in itself. It was a start, in what seemed a new day. I had gotten my own start in New York in the mid-1980s, popping up as one of very few black faces at a book-publishing company. At around the time the Naked City reruns began, I had come to a crossroads at the company; I could stay or I could go, and I decided to go, electing to do just enough brain-deadening part-time data-entry work to support me while I focused on writing. Is there a limit to how nostalgic a person ought to feel, or to how many things he ought to feel that way about? I have nostalgia for this period of my life. I was young, 25 years old, and immersed in writing. At the time, I felt the same way, if that is possible, toward a New York I never knew, the one represented on Naked City. Nostalgia is a purifying vision, one that removes complication. When I think of hanging out and writing in my apartment in the then emphatically unfashionable Cypress Hills section of Brooklyn, for example, I do not focus on how lonely I sometimes was, or on the mice that had the run of the place, or on the soul-killingly long subway ride to Manhattan. And when I think of the era during which Naked City was made, I tend not to remember that I wouldn’t have been allowed to vote in certain parts of the country then, or that if a black person was mentioned as a potential presidential candidate, a punch line was coming. The black-and-white photographs of a Ukrainian-born New Yorker named Usher Fellig, known popularly as Weegee, inspired the 1948 film The Naked City, directed by the noir specialist Jules Dassin. 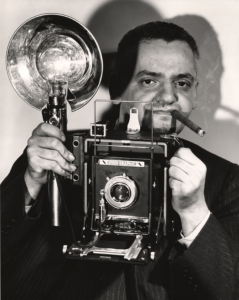 Weegee got wind of murders by hanging around police headquarters in Manhattan and being the only photographer with a portable police-band short-wave radio, which he closely monitored. He often beat cops to crime scenes and sold his pictures to newspapers. His shots of bodies left bleeding on sidewalks and of other, happier slices of the city—rapt listeners at a jazz club, kids playing in front of a turned-on fire hydrant on a sunlit street in summer—reflected the everyday exoticism of New York. Dassin and company brought a similar spirit to the film, which was shot on location; various sequences show the Staten Island Ferry, zoom in on passengers riding a crowded subway train, and follow characters to their homes in the outer boroughs. The particulars that The Naked City records—the ubiquity of fedoras, the supremacy of print journalism—are long gone, but the essence of a New York captured in the film is timeless. 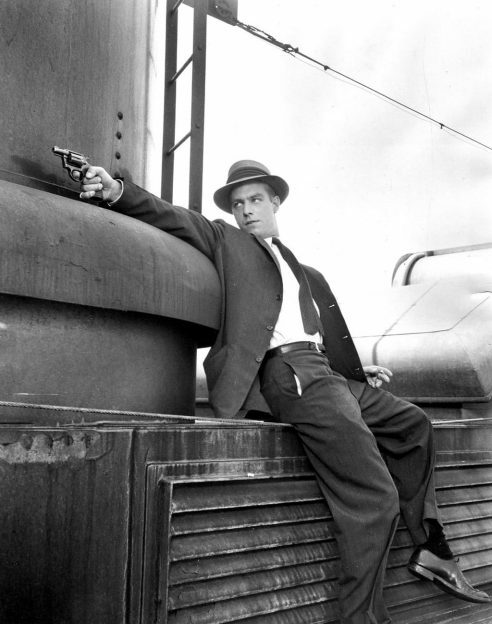 A decade after the film’s release came the television show it inspired, also shot in black and white, many of its episodes featuring the serious, laconic Detective Adam Flint and his world-weary yet good-humored superiors, dressed, like Adam, in fedoras and raincoats. Often running afoul of the detectives are the many characters who pass through the episodes of Naked City, trying desperately to escape the consequences of their bad, irrevocable decisions, their pale foreheads glistening with sweat as hindsight sharpens their regret to the fineness of a needle. Behind them, meanwhile, silent witness to their desperation, to their worst and best intentions, is the physical city, its buildings, rising above the bare limbs of trees in Central Park, a backdrop to the characters’ fleeting lives. If wisdom comes too late to those characters, if they are doomed, the world they inhabit seems to me eternal. The reason it seems so is the same reason that the television show triggers nostalgia in me while the movie that inspired it, made a decade earlier, does not; and in my response is the key to a certain brand of nostalgia. To visit a world as it was fifteen or twenty years before our birth is to go to a foreign land; but to visit that same world at the moment of our debut—in my case the early 1960s, when the TV show was made—is to hit the reset button, to a time when our lives were all future and no past, when the inevitable random turns in our journey had not yet closed off other routes, when anything, everything, was possible. The promises we have made to ourselves, the promises the world has made to us, have not yet been betrayed. This long-ago world is eternally new. On a Saturday in January 1989, in a new brown leather jacket and new hat—not a fedora but a gray newsboy-style cap—I boarded a bus from New York’s Port Authority to Harrisburg, Pennsylvania, to do research for a novel I was writing. In Harrisburg I walked around the perfectly serviceable downtown, which to a New Yorker—even a transplanted one like me—seemed dinky and pathetic; one detail of Harrisburg I have retained is the clothing store under whose name were the words, “Fine Clothing Since 1972.” There was a bar-restaurant I went to in the late afternoon, where I fell into a conversation with a guy who told me about his adventures as a cop and as the road manager (or something) for the music group Menudo. And then I boarded the bus back to New York. This was the period when I was immersed in Naked City, with its gorgeous shots of the city as it looked when I was born. It was dark when my bus approached the city, and there it was, that famous bright skyline. Deep in the bowels of Port Authority, the other sleepy passengers and I disembarked, each of us to his or her own life and possibilities. Could I make myself into a writer? I didn’t know, as I got on the downtown A train and headed deep into Brooklyn, that the question would bring not so much a yes or no answer as a life—with the city as a silent witness—in which I struggled to make sense of notions of blackness and whiteness, to understand my own and other people’s motivations and intentions, bad and good, and to make good use of my fleeting time. Clifford Thompson is the author of the novel Signifying Nothing (2009), Love for Sale and Other Essays (2013), and Twin of Blackness: A Memoir (2015). His nonfiction book What It Is: Race, Family, and One Thinking Black Man’s Blues will be published in the fall. Clifford Thompson’s voyage in Naked City is definitely Inspired me to enjoy his fiction!